In just over a month, Red Deer will be bursting at the seams. In just over a month, Red Deer will be bursting at the seams as 20,000 visitors descend upon the central Alberta city to watch some potential winter Olympians compete at the 2019 Canada Winter Games. The event, which organizers say will be the biggest arts and cultural festival ever to be held in the city, will feature 19 sports, with over 3,500 athletes, managers and coaches. "While we have had World Juniors, the Brier, Scotties and the Canadian Finals Rodeo, I think this does eclipse those events in terms of scale," said Reg Warkentin, policy and advocacy manager with the Red Deer Chamber of Commerce. The games are projected to bring in over $130 million to the area economy, which is welcome news for a region that relies on the struggling oil and gas sector. "Our retailers, our hotel accommodations and restaurants will be getting the lion share of the benefit, so we're really happy to see an event of this scale come to our city," Warkentin said. The games also mean more than $11 million being spent in Red Deer to prepare for next month's kick-off. Much of that will go toward operations of the event, but $3 million has been used for sport-related infrastructure enhancements such as work at Great Chief Park, which will host long-track speed skating. Renovations have also been done at the newly completed Light Park, offering four kilometres of night skiing at River Bend Golf and Recreation Area. Over $1 million in government and private donations has been spent on the project to enhance the many trails and to make it one of the best lit cross-country-ski training facilities in the country. "I would say we're second to maybe the Canmore Nordic Centre for the quality of trails and length of trails," said Brian Johnson, the race course director for Nordic skiing. "In the past 20 years, I've skied out there in the dark, with a headlamp on an old, narrow, twisty trail," Johnson said. "And now I can ski on wide, safe modern trails in full light, so it's literally night and day." A grand opening for the area is scheduled for 5:15 p.m. Wednesday. "It'll really be the legacy impact that you know will be benefiting the region for years to come as we can attract further events and just really capitalize on those assets," Warkentin said. On Tuesday afternoon, the Canada Games torch made its way through Edmonton. 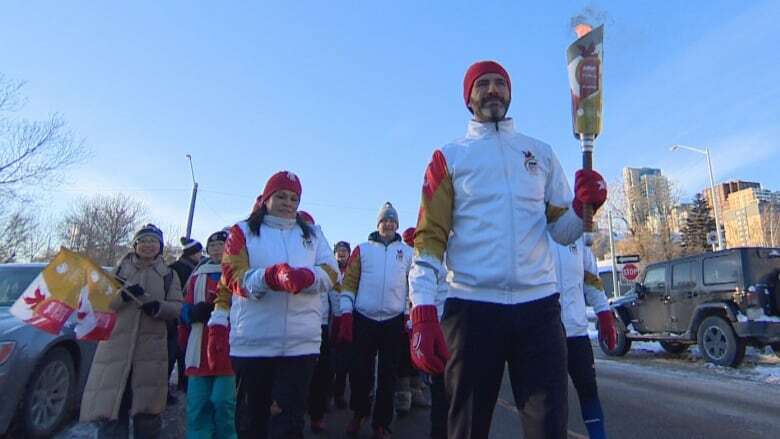 The torch relay kicked off in Ottawa where it was lit from the Centennial Flame on Parliament Hill. It is making its way across the country, stopping in nearly 50 communities along the way for the first time in its 52-year history. "It's taken three months to get across Canada," said Lyn Radford, chair of the 2019 Canada Winter Games. "Even though the provinces will be competing against each other, it's a friendly rivalry and after the games are done these young athletes and their parents, everybody, will come together to celebrate that we're part of Canada," Radford said. This is the third time the event has been held in Alberta. Lethbridge hosted in 1975 and Grande Prairie in 1995. Tickets for the event are available online at Ticketsalberta.com. Passes are $200 for adults, $160 for youth and seniors, and $500 for families of four. Access to some events, including many of the skiing events, will be free, as is the 52º North Music and Cultural Festival.